Over the past couple of years – okay, the past decade – I haven’t really spent a lot of time at the gym….okay, no time at the gym. At all. I gave up the dream of washboard abs a long time ago, and settled on a tub washer with a lint trap. Settling is nature’s way of achieving all your mediocre dreams. I did get a gym membership once – carried that sucker around in my wallet for a whole year, but didn’t lose an ounce. Total waste of money! Well, I have to tell you my latest secret for staying in such great shape….average shape….I have a shape. That’s right – the geriatric crowd has kept this little exercise tidbit from us all this time. It’s probably why they go shopping every day. This exercise is simple, but you need to spend some time finding a cart with an annoying wheel that doesn’t turn properly – usually pretty easy to find at my store; I just look for the abandoned ones. Now, they will either constantly pull to the right or the left – to balance your workout routine, try to swap it out halfway through your shopping trip, or be sure to focus on the other side on your next trip. The constant ‘pull’ to one side provides a steady anaerobic resistance that over time will develop not only your forearms and wrists, it might just clear up that sciatica problem in your hip. Be sure to navigate the store in the opposite direction of the pull or you might spend the day circling the broccoli and never get to the snack aisle. Soup cans are surprisingly heavy if you hold them long enough. Carrying around an arm-full will get you ‘feeling the burn’ in no time. Try getting the soup from the bottom shelf – this incorporates deep knee bends with the repetitive weight lifting of the cans. It doesn’t matter if you don’t like the soup down there – this is about more than your sensitive pallet. You can get some good aerobic exercise as well if you load up your arms then find that your spouse/training partner has moved the cart to the next aisle. This one is pretty self-explanatory. Pick up the biggest bundle of bottled water they sell – again, preferably on the bottom or top shelf – waist height is a waste of time. Be sure that when you try to put it on the lower rack, the shopping cart keeps moving backwards so you have to crab-walk along trying to heave the darn thing into place. Also, as mentioned above, you can get an extra workout if your spouse/training partner has again moved the cart to the next aisle. The great thing about this is that most grocery stores put the heaviest dog food bags on either the ground or 7′ up. Haul that sucker onto your shoulder and once again attempt to slide it onto the lower shelf of the cart. Be sure to stretch fully to extend your soon-to-be tight tendons. Cat food doesn’t count – they don’t eat enough to give you the weight resistance you need. Even if you don’t have a pet, you can hang out and help someone else get theirs. That’s a double win – exercise and some goodwill! Just because you’re done filling your cart and are heading to the checkout, the workout isn’t over yet! 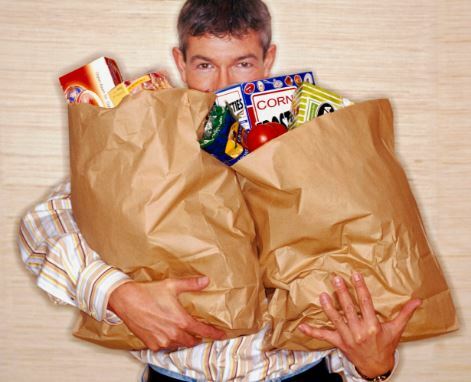 Make sure all the canned goods are packed as tightly and as high as possible into one or two shopping bags. Take advantage of this to work your biceps by lifting them off the belt and into the cart – then out of the cart and into the trunk. 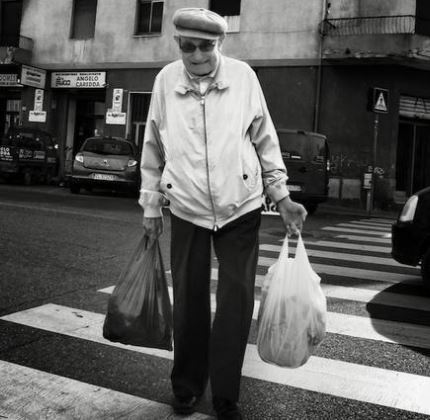 Once you’re done, give the cart forearm crunch one more good go – walk that antagonistic annoyance all the way back into the store…maybe hand it to another shopper who could use a good workout. I’m sure they’ll thank you for it. Eventually.